All Vacations include roundtrip airfare, hotel accommodations, taxes and are completely customizable for summer, fall, or winter travel! All-Inclusive – This 4-star all-inclusive beach resort offers guests attentive service and ultimate comfort. EXCLUSIVE $100 OFF per booking. Customize your length of travel. Valid from departure cities nationwide. Book our entire Mexico SALE! 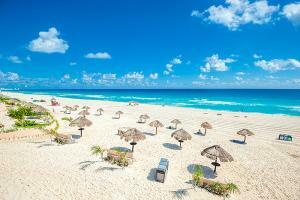 Explore and book all our Mexico Vacation Sale destinations! No matter if you want a stress-free family getaway, an exciting ocean adventure or a romantic retreat, find your perfect Mexico vacation at the best price. Rates are based on roundtrip air travel from Los Angeles (LAX) to Los Cabos and New York (JFK) to Cancun/Riviera Maya and are per person, based on double occupancy. Advertised vacation rate(s) valid for 12/4/18. Additional travel dates available. Rates are based on roundtrip air travel to/from Los Angeles (LAX) for Los Cabos, Austin (AUS) for Cozumel, Orange County (SNA) for Los Cabos and Chicago (ORD) for Cancun and Riviera Maya, and are per person, based on double occupancy. Advertised vacation rate(s) valid for departures 7/22/19.